Organized by Ornah Levy, Esq. All funds raised will go directly to Team PHenomenal Hope . 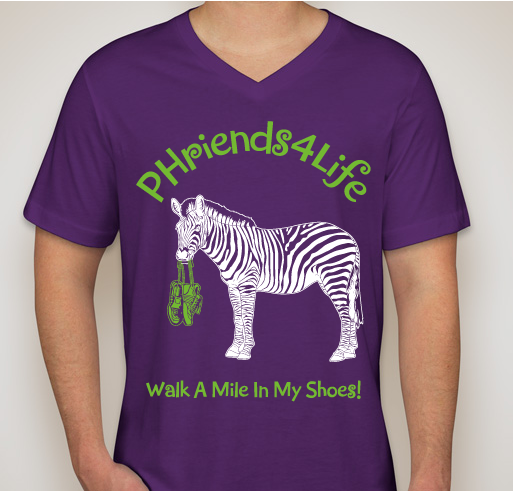 Help us find a CURE for Pulmonary Hypertension! 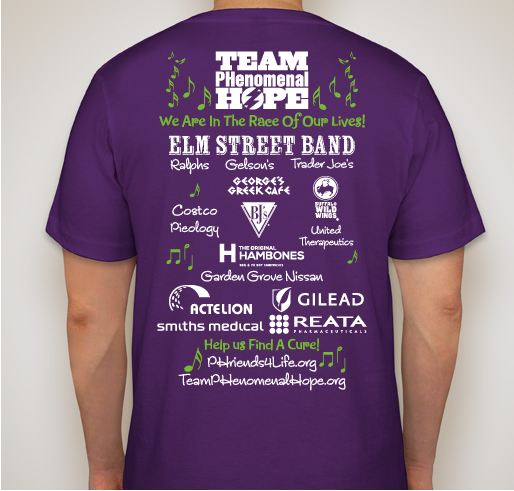 Donations are tax deductible, and will benefit the PHenomenal Impact Fund!! Pulmonary Hypertension (PH) is a rare, terminal, severe heart-lung disease. It is incurable, and does not go into remission. It affects people of all ages and ethnicities. It can be inherited, or can develop as a complication of an underlying autoimmune disorder such as Lupus, Scleroderma, Rheumatoid Arthritis, AIDS, and many others. It can also develop during pregnancy. Many patients have it as a primary disease, without any known cause (Idiopathic). There are currently a number of medications to treat the symptoms of this horrible disease, and a few that attempt to slow its progression, but there is NO CURE. In many cases medications must be administered directly into the bloodstream 24/7 via a central catheter or subcutaneous drip, and all of them come with a wide range of side effects ranging from the unpleasant to the virtually unbearable. PH symptoms may include exhaustion, shortness of breath, fainting, swelling, heart palpitations, chest pain, nausea and dizziness. As this disease constricts the blood vessels between the heart and lungs, and the vessels of the lungs themselves, one has the sensation of being slowly strangled to death, which is precisely what is actually happening. As the blood vessels constrict, the right side of the heart must work harder and harder to push the blood through the lungs and the body, resulting in eventual right heart failure and death. 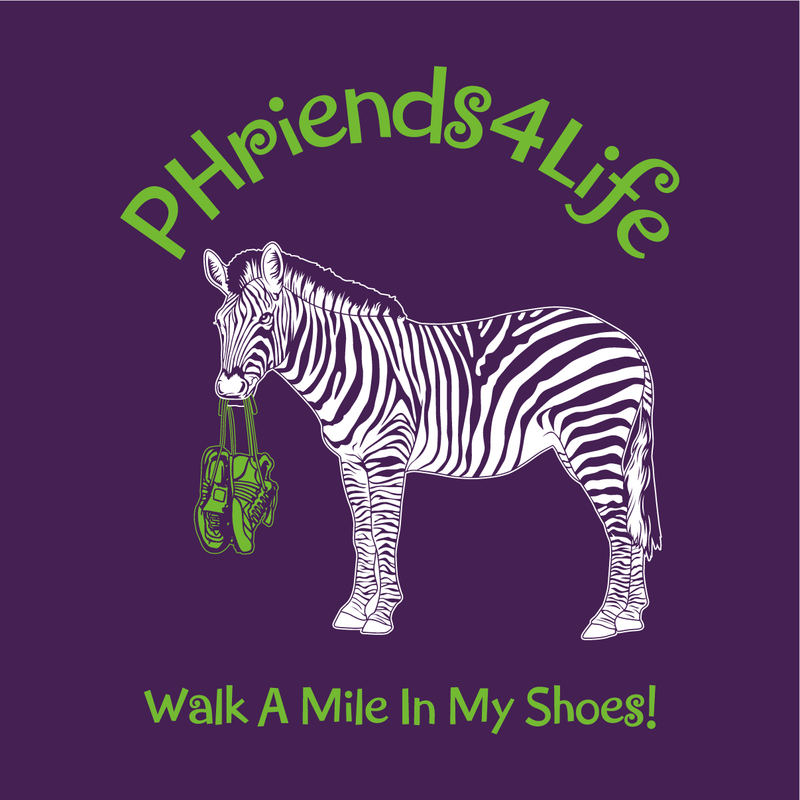 PHriends4Life is a group of Pulmonary Hypertension (PH) patients, caregivers, and their friends, who gather together to put on events to raise awareness about our disease, and raise money for a CURE. 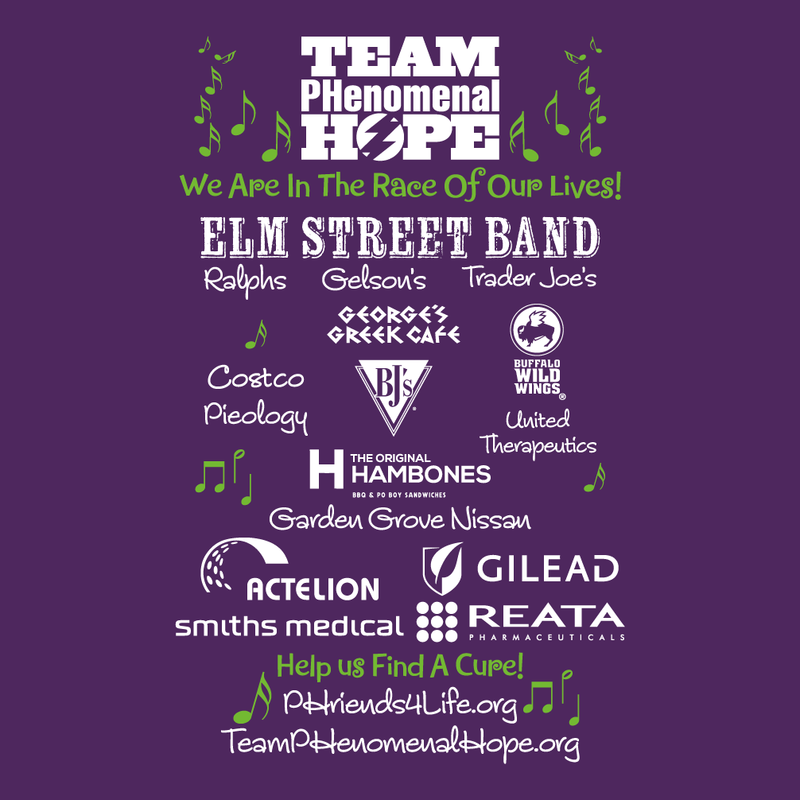 We support the efforts of Team PHenomenal Hope, a group of extreme athletes who compete in extremely difficult races such as Iron Man competitions, marathons, triathlons, and bicycle races (such as the Race Across America (RAAM), the Race Across the West (RAW), RadAmRing, and other extremely difficult races) to raise awareness and research funds for our disease. In essence, we are their cheerleaders. They race for us - they are "our lungs", and we cheer them on and support them in every way possible! After all, they do all that they do to help us find a cure. This disease is so rare that regular primary care physicians and even many cardiologists don't actually know about it, or know how to treat it! In medical school Doctors are taught "Occam's Razor" which says: "When you hear hoof beats, think horses, not zebras." This stands for the proposition that the most common answer is usually the correct one. For example, if someone comes in to the office with shortness of breath, it is probably asthma or maybe they are out of shape. But SOMETIMES it is a rare disease! SOMETIMES it really IS a zebra! So we are the Zebras of the medical community. They are never really looking for us, so they often don't think to look. When I went back to my old doctor to tell him about my diagnosis, he was dumbfounded. He told me that he'd only ever read about PH in a footnote in a medical textbook in Medical School, and that in thirty years of practice he had never met anyone who had it! It is THAT rare. 11 Years ago, in August of 2007, I weighed 500lbs. I was swimming over a mile a week, dieting, and not losing weight! I finally decided to seek a gastric bypass operation. I had to undergo testing for my heart, and I was diagnosed with Pulmonary Hypertension. The problem was that this disease is so rare, even the doctors who diagnosed me didn't really know how to treat it. They thought I should go forward with my gastric bypass operation, as they didn't know that you cannot get PH from being obese. In fact, in my case, it was the other way around! I went on a liquid diet for 4 months, and wasn't losing as much weight as the surgeon expected. He was unkind to say the least as he thought I was cheating. I was not. When I finally went into the surgery, they told me my chances of survival were 30%, but that I needed to do it or I would surely die. They cut me open, and then woke me up 15 minutes later! I was SWOLLEN, NOT FAT! They had biopsied my liver, and my liver biopsy came back with the following stunning results: I did NOT have cirrhosis of the liver, I NOT have a fatty liver (ponder this - I was a 500-pound woman without a fatty liver!) - it was just THE MOST SWOLLEN LIVER THEY HAD EVER SEEN due to backup of blood from my heart! My poor little heart was trying to pump blood through extremely constricted blood vessels and failing. The blood was backing up into my liver, which resulted in an engorged liver. I was sent home with very little explanation, only that they could not help me. It was now December of 2007, and I returned home to a hospital bed downstairs, as I had now lost the strength to climb the stairs to go to bed. I was on oxygen 24/7, and my walking distance was about 4 feet. Much of my hair had fallen out, and my breathing was extremely shallow. Just after the new year, I emailed my pulmonologist to tell him that I had NOT had the anticipated surgery - it had been cancelled. He called me back the next night, from his home, with his baby in his arms. He had a PLAN. I was to go to UCLA Hospital the next day. A PH specialist by the name of Dr. Rajeev Saggar and his brother Dr. Rajan Saggar would take care of me there. Rajeev was starting a two week stint as head of Cardiac ICU, and he would have a bed waiting for me. I asked my Pulmonologist if perhaps I should wait until Monday to go in. After all, I had learned that not much happens over the weekend in the hospital, and tomorrow was Friday. My beloved Doctor, Dr. Russell Klein said, "uuuuuuuh,.... I think you REALLY need to go in tomorrow. Uhhhh I'm not sure you're going to live until Monday!" I was aware that I was sick. I just wasn't aware that it was that dire! You don't know how really sick you are, when an illness creeps up on you over the course of decades of your life, until you finally start to feel better. I arrived at Emergency Room at UCLA that Friday afternoon, and was rushed onto a gurney and into a room. Turns out THEY know exactly how severe Pulmonary Hypertension is! They hooked me up with an IV and oxygen, and as they rushed around I mentioned to the nurse that she should let Dr. Saggar know that I am here. I figured it would be about 15 hours, given the number of people filling not only the ER, but lying on gurneys in the hallway of the ER! 15 minutes later, in walks Dr. Saggar and his group of Docklings (Doctors to be). He shook my hand, looked me in the eye, and addressed me like a human being, not a big fat loser. This was a very nice change for me. He acknowledged that I was an attorney, and that I was severely swollen. Within half an hour I was being whisked up to the Cardiac ICU, and into my room where I would spend the next 3 1/2 weeks. Dr. Saggar perfomed a right heart catheterization and freaked out. My pressures were VERY HIGH! He told me I needed to have my affairs in order, and that I might not make it. He told me not to cough or strain when I went to the bathroom, as I might "blow" at any moment! (Yikes! How do you not cough?!) He said my pressures were higher than 3x normal (normal is 23-24 and mine were close to 100)! He explained that my Central Vena Cava should collapse in between each heartbeat, but mine was like a fire hose. He saw NO MOVEMENT WHATSOEVER! He was clearly concerned. I was just about to turn 40, and not quite ready to check out, so I asked him what we could do to fix this situation. He told me were were going to start me on a very very strong IV medication to dilate my heart-lung blood vessels. We were going to need to titrate (increase the dosage) very aggressively in order to save my life, and that it would feel horrible. I told him to do what he needed to do, and I would cope. He did. And I did. He would come in every few hours, and ask how I was doing, and then we'd up the dosage. I was super duper hot: when your blood pressure drops (because we were dilating my heart-lung blood vessels), your heart races to maintain the pressure, so you feel as if you just ran a marathon, despite the fact that you are lying in bed, not moving a muscle. I couldn't catch my breath, and I couldn't slow my heart rate. It was racing. We had ice packs on me, and occasionally, I'd get really REALLY cold as a result. I had severe nausea, and I recall one day only being able to consume 1 of 2 saltine crackers the entire day. I was THAT nauseous. Then there was the pee-ing. Luckily, I had a "pee bag". As my heart started pumping blood through my body, my kidneys were able to do their job, and Dr. Saggar was able to give me Lasix (a water pill). I peed so much that the bag would overflow onto the floor while the ICU nurses were off running a code. They eventually put the bag into a bucket! In total, I peed 120 lbs of fluid while in Cardiac ICU that month! BEST. DIET. EVER. But that wasn't all! By the time I left UCLA, I was able to walk all the way around the Cardiac ICU ward! That is MUCH farther than 4 feet! Dr. Saggar told me I needed to avoid caffeine from now on, as caffeine constricts my blood vessels. I love coffee, but I haven't had coffee or a caffeinated soda in a decade. My life is more important. He also told me I needed to watch my sodium and fluid intake. Having been on diets for most of my life, I told him I needed a number, not a vague instruction! So he told me to stay under 2,000 mg/ sodium a day. I did. I also watched my fluid intake. By the end of 2008 I had lost a grand total of 300lbs of fluid!! I was also able to walk a mile! Going upstairs to bed no longer took half an hour and the singing of show tunes to get me up there. To say that it felt miraculous is an understatement. Unfortunately, in order to save my life, I had to give up the one "sport" I've always excelled at - swimming. I now have a PICC (Peripherally Inserted Central Catheter) in my arm that delivers my IV medication into my heart 24/7, and I cannot submerge it in water. But it's a good trade-off, as I get to LIVE! I have now lived 10 years past my expiration date! When I thanked Dr. Saggar for saving my life, and asked him how I could ever repay him, he said, "Just live well" - and so I do. But I am also committed to spreading awareness about this dastardly disease, so that others might get diagnosed a bit more rapidly, and seek treatment early. I raise research funds because we need to find a CURE! I am co-leader of the Long Beach / South Bay PH Support Group, and we have lost about 10 PHriends in just this past year. It is painful, and it is unnecessary. Ornah--your story is both inspirational and tragic. Through it all, I only know you to be positive, kind and generous! You've also touched the lives of my students through years of your work with our Mock Trials. Thank you! Ornah is a a beautiful spirit whose bright light needs to continue to shine! We love our ‘nother daughter, Ornah!! We are Hoping for a cure!!!! Share Why You Support "2018 PHriends4Life Concert in the Park"